Creating a magazine gives students a chance to learn about real-world applications of math. “When will I ever use this?” If you’re a math teacher, this is a question you’re very familiar with. As the math curriculum becomes ever more abstract in middle and high school, it’s difficult for students to see when and where the material they’re learning will be applicable. Just telling them that the material will be useful for their following math courses or future academic career doesn’t cut it—and it shouldn’t. This is when the “unreasonable effectiveness of mathematics,” as explored through reading and writing, is the ace up the sleeves of teachers. Reading and writing are complex, fundamental, integrative learning skills that should be used to their potential in math class. Reading is a two-part process that is similar to mathematics in that it requires first the transfer of encoded information to the reader and then the comprehension of that information. And writing is one of the most powerful modes of learning because it engages both hemispheres of the brain—one side generates ideas, the other structures them. Effective writing also clarifies and organizes a student’s thoughts, and the slow pace of writing is conducive to student learning because it allows them to reason carefully to make sure they’re correct before they state their thoughts. 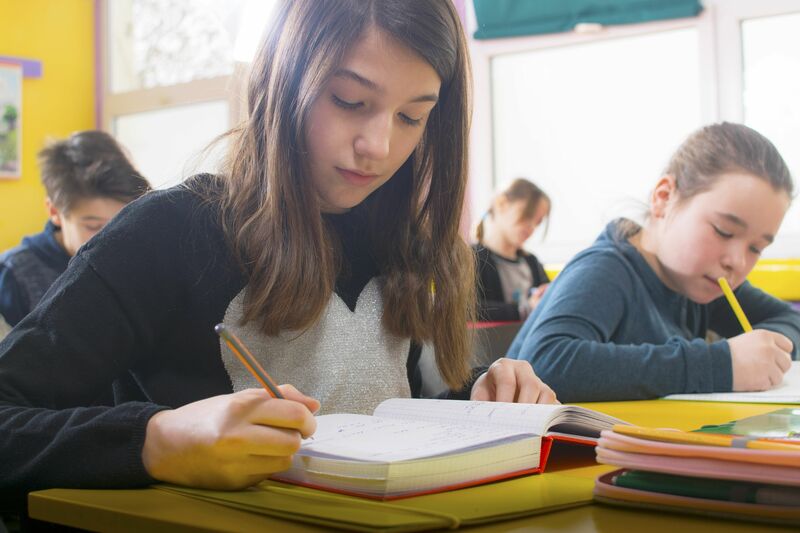 Studies have shown that writing is valuable specifically for the math classroom—for example, it seems that a student’s ability to explain concepts in writing is related to the ability to comprehend and apply them. And of course written explanations also allow the teacher to understand and assess the student’s thinking in a way that computational steps alone may not provide. Although writing prompts for the elementary—and less frequently for the middle school—math classroom have been available for some time, they generally focus on attitudes and dispositions, likes and dislikes, and thoughts, concerns, and feelings about math or math class. They include journals, math autobiographies, letters to the teacher, and freewriting activities. They involve writing about a concept or a process the students are studying, or center on metacognitive skills such as effort, goals, expectations, study habits, and so on. These prompts can be adapted for high school students, but I’ve found it more useful to use reading and writing to illustrate how mathematics is embedded in every aspect of life. Reading and writing are particularly effective in developing a quantitative understanding of the world around us because they can be used to lead students to reflect on everyday experiences. One assignment that I’ve found effective is having students create a magazine of excerpts of articles about various applications of mathematics in real life. A magazine about math in the real world, produced by high school students. The magazine—I’ve included an issue here—is composed of summaries of published articles, so to get students started, I keep an updated list of articles that highlight the ways math is present in different facets of the real world—from the probability that a soccer team ends up in a particular World Cup group to gerrymandering, fractals in Jackson Pollock’s paintings, black holes, the fairness of social media, invisibility cloaks, and more. I select articles from a variety of newspapers, journals, and magazines, such as The Washington Post, The New York Times (especially the Upshot section), The Economist, New Scientist, Scientific American, and The Atlantic, as well as from blogs, websites, podcasts, videos, and other online resources. The app MathFeed (downloadable for free in the Apple App Store), curated by mathematician Francis Su, is my most valued and trusted source—it allows me to find the most important news and views about math in the media in a single place. After picking an article that has piqued their interest—from the list I provide or other sources of their choice—the students read it carefully, summarize it, and post it on the online magazine. (If they want to work with an article they have found, they have to ask me first so we don’t end up with repetitions in the magazine.) They know they’re required to understand the article content properly, edit their summary thoroughly, provide a visual to aid their readers’ comprehension, and cite their source. I give them access to the draft of the magazine, and they also have to upload their article and take care of any technical issues that may arise. For assessment, I’ve created a simple rubric that looks at content understanding, clarity of communication, editing, critical thinking, initiative, and creativity. This has been one of my most popular projects—students are amazed to discover some of the myriad applications of math. They also enjoy being able to choose articles according to their interests, and appreciate that the end product, the magazine, can be easily shared with family and friends and stored in their own e-portfolios. This is a valuable activity that encourages students who enjoy reading and writing more than the computational side of math and gives all a deeper understanding and stronger appreciation of the usefulness and effectiveness of mathematics.